Most Montanans take for granted the ability to turn on a faucet and see water pour from a spigot or to illumine a room with a flip of a switch. Yet, in places such as the mountain villages of Guatemala, these commonplace amenities remain largely unattainable. It’s a situation that one man from Columbia Falls, Dave Renfrow, has been helping to change through a most unlikely vehicle for change—bicycles. An avid international cyclist, Renfrow has biked for the past five years everywhere from Paris to Panama, covering as much as 4,000 miles per itinerary. It was while reading online bike journals where other cyclists shared their adventures when crisscrossing Central America that he learned about a Guatemalan organization called Maya Pedal. 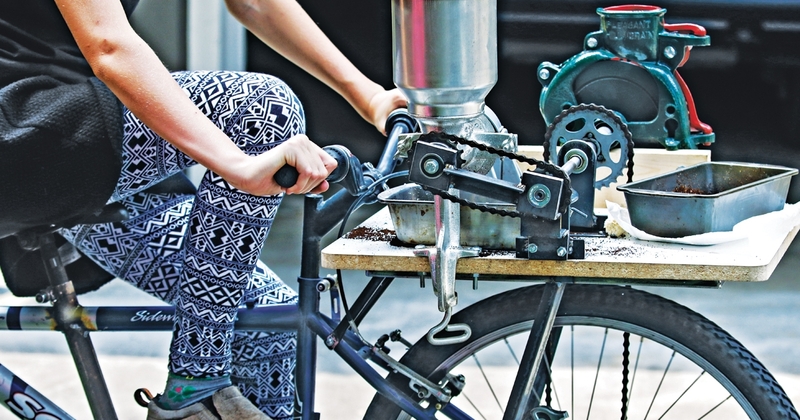 Its history dates back to 1997 when members of the Vancouver, BC non-profit, Pedal, came to Guatemala to help establish the concept of pedal-powered machines. Four years later, Maya Pedal became a Guatemalan-owned NGO. When Renfrow read that they convert used bicycles into foot-powered machines to perform labor-intensive tasks traditionally done by hand, the idea resonated with him. Between his love of cycling and his civic-minded nature, Renfrow couldn’t resist getting involved with these inventive bicimaquinas (bike machines). “After 500 years of colonial rule, this is our last best chance to preserve and help an indigenous culture move into the 21st century in the Americas,” commented Renfrow. “The bike is an appropriate technology for emerging economies. You just get on it and pedal. Leg power is five times more productive than arm power and 20 times faster than finger power. This is especially important because Guatemalan children very often are the ones cobbing the corn that’s eaten at every meal or de-pulping coffee beans instead of attending school. Not surprisingly, when he planned his first four-month biking odyssey through Central America, the Guatemalan village of San Andres Itzapa, Maya Pedal’s home, made his must-see list. Without doubt, Renfrow, whose career spanned 40 years in the architectural millwork industry, fell into the connected-and-return category. Admittedly neither a bike mechanic nor a welder, he can, however, rightfully lay claim to the title of a journeyman who can do anything with wood. Upon his initial arrival at Maya Pedal, he assigned himself the task of building kitchen cabinets and bunk beds for the volunteers’ hostel. As it turned out, Renfrow managed to collect and ship some 400 bicycles contributed mostly by Montanans from Libby, Columbia Falls, Whitefish, Polson, and Missoula. And since he owned high quality tools that his dad, a master woodworker, had personally used to build his successful Columbia Falls cabinetry business, Renfrow included them, as well. Every hammer and chisel was appreciated. So was each bike, no matter how old or how many gears it possessed. “I became involved because it was so real. When I went to the shop, it was a working shop—underfunded with worn out tools. People were doing good by building machines, to elevate somebody else’s income,” noted Renfrow. Maya Pedal will take any functional bike, though by the time it’s repurposed into a pedal-powered machine it only marginally resembles your old Schwinn. “We like steel frames the best. Unlike aluminum frames, they can be welded and turned into the bicimaquinas that can then become corn cobbers, grains mills, coffee bean de-pulpers, and tile makers among other things. Bike machines can also pump water from as far down as 105 feet for drinking or irrigation,” added Renfrow. About 70 percent of the donated bikes are turned into foot-powered machines; the rest are either sold or dismantled for parts. The intact bikes get used for transportation or micro-businesses. According to Renfrow, whatever their end result, they are changing the lives of Guatemalan villagers for the better and providing simple solutions for complex problems. They’re also enabling the Mayan people to stay in their homes and not feel compelled to migrate. As he explained, changing weather patterns have caused much of the problem. There’s no longer a wet and a dry season in the lowlands of Central America. Instead of daily afternoon showers for five months, the total annual rainfall now comes in about 12 days of sporadic torrential downpour and flood, followed by drought. At 5 feet tall, Renfrow may be short in stature but his humanitarian character has already cast a long shadow extending from the Flathead Valley to this Central American country. He credits his height as having a profound influence on his approach to life. Although Maya Pedal’s accomplishments may sound provincial, they are hardly that. The non-profit’s worldwide impact has been more far-reaching than anyone in the remote village of Itzapa could have imagined. Maya Pedal is now in the process of making their designs available globally, to meet the numerous requests received from other countries. One way Renfrow helps is by answering correspondence from English-speaking places such as Oxford University and the Smithsonian Institution. The former wanted photos of the bicimaquinas for a book they were publishing. The latter wanted to purchase a bicimaquina for an exhibit being held at the Bill & Melinda Gates Foundation in Seattle, featuring 25 innovative exhibitors from around the world. Interestingly, when Renfrow views his contributions to the organization, he sees something else as being of more value than his expertise with wood or the written word. For more information, visit www.maya-pedal.org or email: mayapedalusa@gmail.com.